pertaining to a cistern, especially the cisterna cerebellomedullaris. cisternal puncture puncture of the cisterna cerebellomedullaris with a hollow needle inserted just between the occipital bone, to obtain a specimen of cerebrospinal fluid. See also lumbar puncture. Patient Care. Preparation of the patient for this procedure should include a detailed explanation, because insertion of a needle so close to the brain may cause apprehension. The physician may request that the back of the neck be shaved. The patient is positioned on either side with the head bent forward and held firmly by an attendant. Complications seldom occur, but the patient should be observed for signs of dyspnea or cyanosis during and immediately after the procedure. A cisternal puncture is often done in the outpatient clinic, and the patient is allowed to go home soon after it is completed. passage of a hollow needle through the posterior atlantooccipital membrane into the cerebellomedullary cistern. the insertion of a needle into the cerebellomedullary cistern to withdraw cerebrospinal fluid for examination, usually performed with fluoroscopic guidance. The puncture is made between the atlas and the occipital bone. 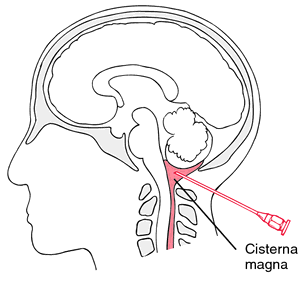 Passage of a hollow needle through the posterior atlantooccipital membrane into the cisterna cerebellomedullaris. puncture of the cisterna cerebellomedullaris (magna) with a hollow needle inserted through the aperture between the occipital crest and the anterior edge of the atlas. A sample of CSF may be collected, contrast medium injected or pressure measured. See also spinal puncture. a channel between opposing layers of a highly convoluted single membrane in the endoplasmic reticulum of all cells.